Ok so what in the world is this picture? 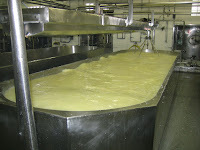 Well it's a vat in a cheese factory where the curds are separated from the whey. Pretty cool right. If you ever get a chance to go to a dairy factory (especially where they make cheese) it's pretty cool. My grandparents took me when I was about 9 and it is a very distinct memory. I remember seeing a vat like this. So thinking about my newest bread: Asiago Herb, made me think about cheese and the factory. My new bread is whole wheat, light textured, and flavorful with savory fresh herbs and delicious Asiago cheese throughout. But don’t take my word for it- try it for yourself! Hi Elizabeth! You have my mouth watering. Sounds fabulous!